Dean Graziosi is well-known as being a leading success coach, business owner, entrepreneur, real estate expert, author and speaker. Based in Scottsdale, AZ, Dean has written multiple New York Times best-selling books and has touched the lives of millions of people around the world with his powerful messages and remarkable education, with his social media profiles reaching millions and millions of people weekly. 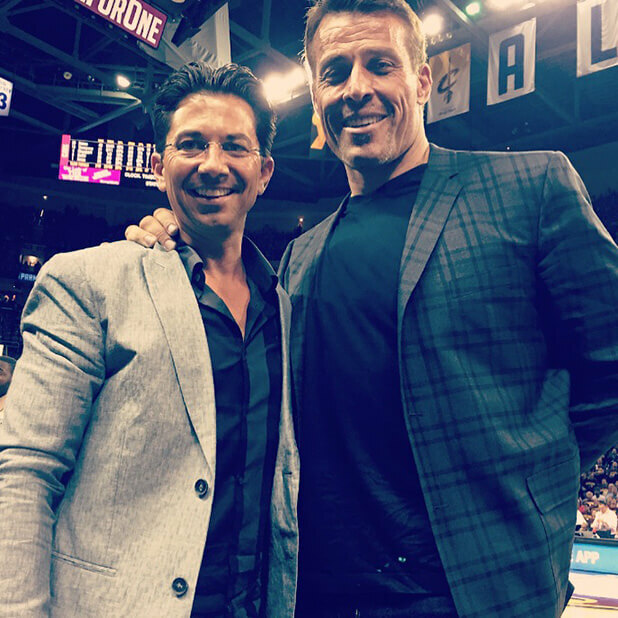 Dean Robert Graziosi is a well-known American entrepreneur, marketer, success coach, business owner, real estate investor and leading trainer throughout the world. He has appeared daily on American TV for nearly 15 years and is highly respected as a top businessman, entrepreneur, multiple New York Times bestselling author and Inspirational speaker. Graziosi is perhaps best known for his long running interview style TV shows and for becoming the leading real estate educator in the world. He has reached viewers in America and around the world who number in the millions. He has written five books which have dominated the success, business & real estate book sales space since 2006, with his best-selling book amassing over 1,000,000 copies sold. Graziosi was born and raised in Marlboro New York. Dean Graziosi is the son of Paul Graziosi and Gloria Post. He is the youngest of two, having an older sister. When he was 3 his parents divorced and he was raised mostly by his mother and Grandmother until the age of 13 when he then moved in with his father. His growing up was no easy task as the family faced many financial difficulties and he moved more than 20 times by the age of 19. He went to Marlboro High School and never went to college. Before the age of 20 Dean had his first entrepreneurial success story by buying, fixing and reselling cars, while also completing his first real estate deal. Dean, who had no capital at the time; cleverly bought a run-down apartment with no money down. This experience encouraged him to continue investing in real estate. Dean is the father to two beautiful children Breana born in 2006 and Brody born in 2008. He lives in Phoenix Arizona. In 2010 Dean teamed up with a company whose owners had over 15 years of expertise in managing and running live events. Dean teamed up with them to start delivering a personal experience of a live event in cities across America. This personal touch combined with Dean’s proven training and impeccable reputation lead to Dean’s lives events quickly growing to be the best Real Estate live event training company in America by the beginning of 2011. In 2002, Dean Graziosi formed Dean Enterprises, LLC as the creation and production company for his real estate information products. Dean Enterprises exclusively produces all of Dean’s Infomercials & books. Dean has pioneered better education for those desiring more in life. Taking a industry riddled by promises of overnight success, Dean wanted to stand out by simply sharing the truth. Dean provides those who want to reach that next level of success with the appropriate tools to get there, and get there with confidence. Dean also owns a company called JBB Enterprises, LLC that manages his real estate holdings and flips. Dean personally does hundreds of real estate deals each year. This not only allows him to build wealth and legacy but keeps him sharp on the ever changing real estate market so he can share what he learns with his students. Dean is co-founder of The Centurion Mastermind Group that in the past few years alone has raised and donated over $1 Million Dollars to Richard Branson’s charity organization Virgin Unite. In 2007 Dean founded “Operation Free Home,” a program that provides people in need with a home to live in, free for one year, to help them get back on their feet. Dean also consistently helps out those less fortunate and those affected by tragedy. He donated thousands of dollars to the community of Joplin when the Tornado hit and donated directly to relief efforts being spearheaded by a church in a community hit by Hurricane Sandy. And many other tragic events. Dean has been on TV every day since 1999 and probably has more TV exposure then many popular celebrities. Dean Graziosi has appeared on almost every single major Network and all local Broadcast TV stations over the years. Currently Dean Graziosi constantly updates content and training videos for free on his social community and has an active podcast channel. For more than 20 years, Dean Graziosi has taught people from many different backgrounds how to confidently change their life, create a thriving business and also profit from real estate investing with little or no money down with the ultimate goal of teaching a person how to support oneself thus achieving financial independence. Dean strongly believes in the interdependence of people including colleagues, friends and family, even strangers upon each other. This synergy is in part what drives success and allows for everyone to thrive on a new level, thus creating a better world to live in. Dean is uniquely qualified to educate others about how success is truly derived and how to go from where you are and get to where you want to go. What sets Dean apart from other educators and experts? He truly does care. For over a decade, he has been sharing from his heart this knowledge and handing the keys to success to anyone who is willing to learn about the strategies to get to that next level of life. Why is Dean Graziosi so famed in the world of success and education? It is because he is the people’s people and in a simple yet affective way he has reached millions across the country and the world with his books, audio and video courses and seminars. He has taken the knowledge that helped him to become a successful entrepreneur and shared that knowledge with others who dream of gaining fulfillment. A frequent guest on nationally televised programs, Dean has been seen and heard by viewers numbering in the millions. Books authored by Dean Graziosi have been on The Wall Street Journal, USA Today, Amazon and the New York Times bestseller list.